The decision to undergo LASIK surgery is one that will impact your life forever. At Vance Thompson Vision, we know how important it is to wake up each morning to clear vision. Because improved eyesight means more than seeing your best, it means being your best. When you schedule a consultation at Vance Thompson Vision, our specialists in laser vision correction will help guide you through the details of your LASIK procedure. All LASIK procedures from our Alexandria office are referred to and performed by Dr. Mike Greenwood at our Fargo location. What’s the most important part of your surgery? Quite simply, your doctor and the technology he or she uses. The team at Vance Thompson Vision takes pride in being world leaders in quality vision correction and setting global standards for care. In addition to their precise techniques, training, and distinctions, they lead the way in the future of laser and vision correction with extensive research and a commitment to using only the most advanced technology available. "As a person with a very high correction I never thought laser vision correction was an option for me. Well, I was wrong. The team over at Vance Thompson Vision were so helpful, knowledgeable, caring and attentive! I had LASIK done last week and it is remarkable how well I’m seeing...and it getting better everyday! Having two little ones that still wake at night it’s such a relief to not have to reach for my glasses every time they need me. Thank you VTV for giving my eyes new life!!!" "It's been less than 1 week since my lasik surgery, and during my checkup today I was informed that I was already seeing 20/15!!!! There are no words to describe how happy and grateful I am for Dr. Thompson and his professional associates. This is by far the best investment I have ever made. My surgery may be paid in full, but I'll forever feel indebted. It's been a great ten years, glasses. But I'm sorry to say, you will not be missed!" "I used to think Disney World was the happiest place on earth....then I hadn't LASIK consultation at Vance Thompson Vison! Seriously, EVERYONE was smiling and treated me like a queen! What a great experience!!" "Everyone I worked with was amazing! I just got lasik and they did such a good job explaining it all." "I had Lasik surgery on Thursday Feb 11th and I am so happy with the results! I could see immediately after surgery. My vision was very bad, it's like a dream come true! Vance Thompson did my surgery, he is amazing, very professional. The whole staff team was awesome. Great customer service! Highly recommend Vance Thompson Vision ;)"
Laser Vision Correction involves using a precise computer-controlled laser to gently reshape the cornea, allowing light rays to focus more directly on the retina and ultimately, reducing your dependence on corrective lenses. The in-office procedure lasts only a few minutes per eye and most patients can return to work the next day. Laser Vision Correction can correct refractive errors such as nearsightedness, farsightedness, and astigmatism. Understanding how Laser Vision Correction improves vision requires a basic knowledge of refractive errors and how the eye focuses light. To focus light rays, the eye depends on two major focusing elements: the cornea (the outer surface of the eye) and the lens (inside the eye). In an ideal eye, the cornea and the lens work together to focus light rays onto a pinpoint image on the retina. If light rays do not focus directly on the retina, the eye will be nearsighted, farsighted, or astigmatic. In preparation for LASIK, your eyes will be numbed with anesthetic eye drops. The surgeon will then place an eyelid holder between your eyelids to prevent you from blinking during the procedure. Next, a thin protective flap is made in the cornea. Some centers make this flap with a handheld, razor-sharp blade called a “microkeratome.” At Vance Thompson Vision, we always use a laser to create this flap. The laser is the most accurate way to perform this critical step in the procedure. After the flap is created, the surgeon folds it back out of the way, then gently reshapes the exposed cornea with an Excimer laser. The actual procedure only lasts a few minutes per eye. When the cornea is reshaped properly, it works better to focus light into the eye and onto the retina, providing clearer vision than before. Following the laser correction, the flap is laid back in place where it will bond with your eye without the need for stitches. Most people can return to work within 24 hours. With femtosecond laser technology, LASIK is a completely bladeless approach to refractive surgery that is even more precise than traditional LASIK. LASIK is essentially a two-step procedure. The first step is the creation of a thin protective flap on your cornea, and the second is the actual correction of your vision, as a laser beam gently reshapes the cornea. Until recently, the traditional LASIK flap was created with a handheld blade, but with femtosecond laser technology, the flap is formed using a computer-controlled laser. The result is a safer, incredibly accurate, less invasive approach to the flap creation step in the LASIK procedure. Because bladeless LASIK affords the surgeon greater precision and predictability in creating the flap than traditional LASIK, each flap is more specifically designed, and therefore, able to be more securely repositioned. The accuracy of this computer-controlled procedure significantly reduces the possibility of complications. Not only has bladeless LASIK made vision correction more exact and predictable, but its unique level of precision also makes it more accommodating to patients who may not have been candidates for laser vision correction in the past. Through its increased accuracy and safety, this technology allows for correction even in cases of above-average pupil size, thinner corneas, and higher corrections. While most centers have only recently invested in this world-class technology, Vance Thompson Vision was one of the first centers to use femtosecond technology to create the initial LASIK flap. Since 2001, femtosecond technology has been the standard of care and Vance Thompson Vision boasts four different femtosecond laser technologies with exacting specifications for your eye. Custom LASIK is the first FDA-approved LASIK procedure customized to your vision. Not only can this procedure correct your vision, but in many cases, Custom LASIK can actually improve it. How? This procedure effectively maps your eye's unique visual irregularities to include those that cannot be addressed by glasses, contact lenses, or conventional laser surgery. Visual irregularities, such as nearsightedness, farsightedness, and astigmatism (all known as "lower order aberrations") are responsible for approximately 90% of your visual blur. The remaining distortions in your vision are a result of other unique imperfections in your eye called "higher-order aberrations," which affect the overall clarity of your vision, especially in low-light situations. Until recently, laser vision correction like correction via glasses and/or contacts was only able to correct lower order aberrations. However, with revolutionary new Wavefront technology, our doctors are now able to generate a unique structural map of your eye and correct lower and higher order aberrations. Preparation for the Custom LASIK procedure begins by using the Wavefront device to transmit a ray of light into the eye. When the light is reflected off the retina, it travels back through the cornea and the lens and is picked up again by the Wavefront device. This device uses the light to cast all of the eye's irregularities as a 3D image, known as a Wavefront map. This Wavefront map serves as an optical fingerprint of your vision, allowing our surgeons to treat your lower and higher aberrations. LASIK has always been a two-step process. With traditional LASIK, a handheld blade is used to create the flap and a laser is then used to shape the cornea. But Custom LASIK (combined with bladeless femtosecond laser technology, the most precise LASIK procedure ever) uses a computerized laser both to create the flap and shape the cornea. Custom LASIK is the first and only completely bladeless LASIK procedure to utilize an all-laser approach, both to make the corneal flap and customize the correction through Wavefront-guided technology. With multiple laser platforms, we can better address your unique eyes. For vision correction, we use the Wavelight Allegretto 500 kHz in addition to the VisX Star V. For flap making, we have the IntraLase IFS and the Wavelight FS500 among other laser options. Vance Thompson Vision was the second surgical center in the world to perform the Custom LASIK procedure in conjunction with the first Intralase femtosecond technology. The actual laser used in LASIK, LASEK, PRK, and laser vision correction is known as the Excimer laser. This Excimer laser is used to permanently change the shape of the cornea, or the outer layer of the eye. The Excimer laser, which is a specific type of "cool" laser, generates its power from light in the ultraviolet range. It cannot be visualized by the human eye. Because the laser does not generate any heat, there is no tissue damage as the result of the laser light. As the treatment with the laser proceeds, microscopic layers of tissue, approximately 1/10th the width of a human hair are removed. The laser is programmed to remove precisely the amount of tissue needed to achieve the desired result. It’s always important to have realistic expectations for your vision correction surgery. The overall goal of LASIK is to reduce or eliminate your dependence on glasses or contacts, and while many patients experience dramatically clear results, it does not always guarantee perfect vision. Some patients will still need occasional reading or driving glasses after the procedure is completed and although there are many benefits to laser vision correction, there are also risks. This is why the surgeons at Vance Thompson Vision use the most advanced technology available to minimize risk and maximize accuracy. Is Laser Vision Right for You? Technological advancements continually allow more people to qualify for laser or implant vision correction than ever before. Generally speaking, anyone who sees well with glasses or contacts and has not had a significant increase in their prescription in the last 12 months is most likely a good candidate. Those who have certain medical conditions may not be good candidates. The specialists at Vance Thompson Vision will help you evaluate your options with an extremely thorough eye exam and take the opportunity to learn more about you, your expectations, and your lifestyle. 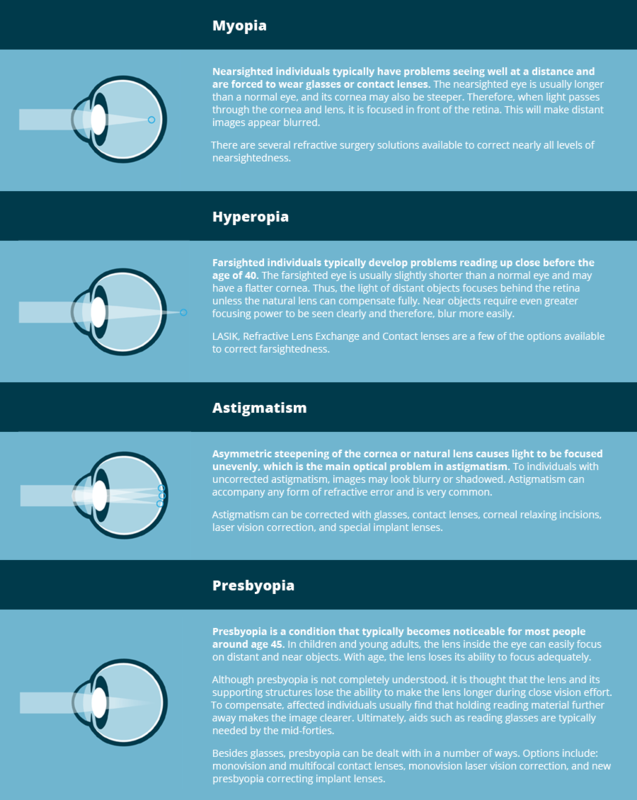 All of these factors play an important role in choosing the laser or implant vision correction technique that’s right for your eyes. LASIK eye surgery is a surgical procedure performed on the cornea part of the eye. It is very necessary that LASIK candidates are well educated on the potential benefits and risks of the LASIK procedure. As with any type of surgery, risks are involved. After your pre-operative evaluation, you will have a good idea about the risks and what they mean to your specific visual situation. It is important to discuss any concerns with your surgeon and weigh the risks and potential benefits. Each patient's vision is different and different treatment options are available in order to give the best possible results. The only way to determine if LASIK is right for you is to come in and discuss your options with our LASIK coordinator. Vance Thompson Vision is committed to safety and patient care and as a result, we invest in the latest technology and the most advanced procedures. If you are not a candidate for LASIK eye surgery, there may be other options. Please feel free to discuss your specific visual situation with our staff and we will determine the best possible solution. While other doctors say "Don't move," we say "Don't worry!" Don’t worry about the possibility of complications being caused by involuntary eye movements during surgery because Vance Thompson Vision’s custom lasers feature tracking systems that track up to 4,000 times per second, precisely monitoring all eye movements throughout the procedure. This ensures that each tiny flaw in your vision is corrected safely and accurately. Begin your journey today to reduce your dependence on glasses and contact lenses. Call to schedule your free LASIK consultation in our Alexandria office, or click on the Contact Us button to learn more. Vance Thompson Vision uses a platform of advanced technology and surgical expertise to provide the highest level of vision correction.